Christine had commented on the avocado mound that was sidling up next to the stacked enchiladas from a few days ago. Funny that, since I was planning to blog it! She’s an observant one. My first true exposure to the beauty of avocados was the first time I lived in California. My pal, Melinda, had two giant avocado trees in her backyard and she always asked me to make the guacamole whenever they hosted parties for the club volleyball team. Then before we’d head home for the evening, she would grab me by the arm and foist a grocery bag full of avocados on me. “Take these!” she would insist. Gladly, Mel. In New York, I recounted how we used to roll avocados across Melinda’s backyard to see if her cat would be fooled enough to pounce on them. My lab mate looked at me incredulously and said, “Oh sure, roll $3 here, $3 there!” I realized how ridiculous it sounded, and it became more painfully clear when I started shopping for avocados in the Northeast. Because my better half eats the guacamole I make, I have modified it so that there aren’t chunky bits to offend his sensitivities. Jeremy has expanded his culinary horizons since the day we met to beyond what I thought was humanly possible, so I cannot complain (too much). His objections are mainly with the raw tomatoes, raw onions, garlic, and jalapeño being chunky. Basically everything but the salt, lemon, and avocado. Sheesh. But he admits that the flavors are important. This is why I mince the garlic and then sprinkle the salt on top and use the flat of my knife blade to pulverize it into a garlicky paste. I must admit that I find a honking huge chunk of raw garlic to be a little disconcerting in guacamole. I deseed the tomato because I don’t like the added moisture from the guts. Just chop it along the equator and squeeze/shake out the guts or run a spoon or finger through to remove it all. Then I cut it into a fine chop so you’d never know a tomato was in there save for the color in the guacamole. And when handling a jalapeño pepper, do yourself a favor and wear a glove because rubbing your eyes after handling one with bare hands is a miserable, miserable, wholly unhappy existence (ask me how it is I know). 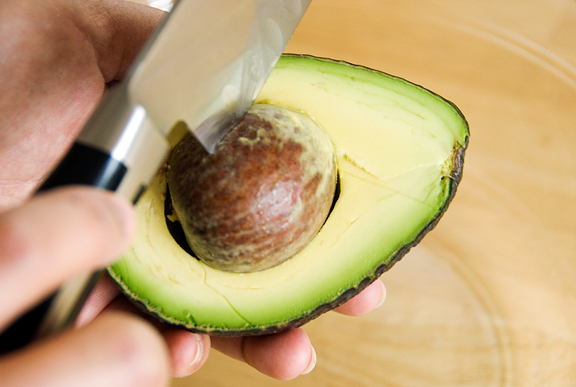 Halve the avocados and remove the pits. Scoop out the flesh into a sturdy bowl. 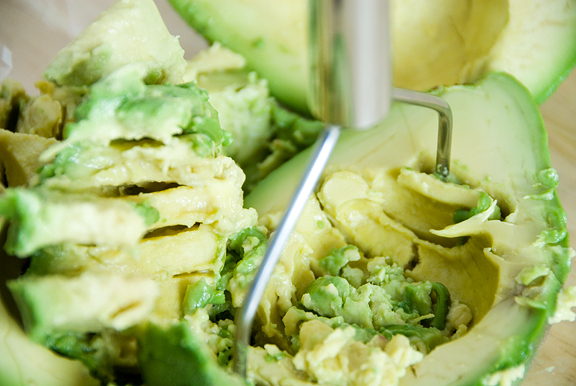 Mash the avocado to a consistency of your liking. 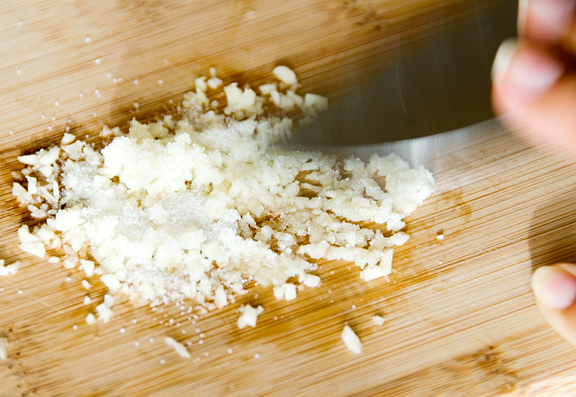 Smash or mince the garlic clove and sprinkle the salt over the garlic. Turn the knife blade on its side and press the salt into the garlic forming a paste. Add the paste to the avocado. But the tomato along its equator and remove the seeds. Dice the tomato to a consistency o your preference. Add to the avocado. Deseed the jalapeño and mince the pepper. Add to avocado. 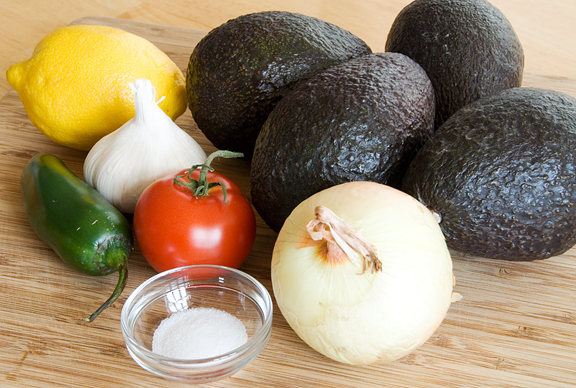 Chop or mince the sweet onion and add to the avocado. Mix the ingredients together and then pour lemon juice to taste. Add more salt if needed. 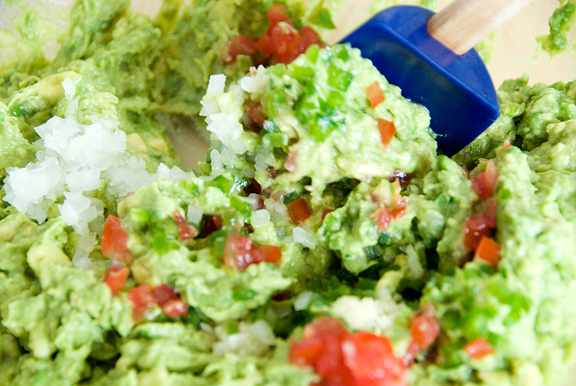 If not serving right away, wrap the guacamole in plastic wrap, pressing the wrap down to touch the surface of the dip so you minimize the amount of air between the two layers. Refrigerate. Guacomole is my favorite thing to eat a loud and fun dinner parties where the booze is always flowing and you can’t remember the last half of the night. And yet the next morning, the guac dip is GONE! The perfect guacamole! Forget the sour cream. I’ve got to slather guacamole all over my Mexican food! Gorgeous! I think I’ll make some ASAP, although I’ll keep mine chunky! P.S. I’ve ALWAYS wanted an avocado tree in my back yard! Your friend is so lucky! I love homemade guacamole! Nothing compares to it! Yours looks delicious and beautiful! guacamole is the most underrated and undeservedly ignored condiment. can it be called a condiment if i could, would, and do eat it with a spoon? so cool and creamy and delicious. great, now i’ve made myself hungry and there’re no avocados in sight. beautiful guacamole! thank you, thank you for not adding sour cream. such nonsense would be criminal! Delicious, I wish I thought of it before! I love guacamole! your’s looks amazing! The avocados around here are not good quality so I’m trying to be patient…wish I could eat your photo! Well that looks like really good guacamole, and so easy to make. I “have” to have avocados everyday….I love guacamole, bad, I could have it all day long…and that would be the death of my hips!! WoW! You take fresh to a whole new level! I have gotten jalapeno oil from my finger into my eye and know that this is a horrible experience! Not only that, but 2 seconds later, I did it again. By then, my hubby thought it was kind of funny. Funny how the burn doesn’t just leave either =). 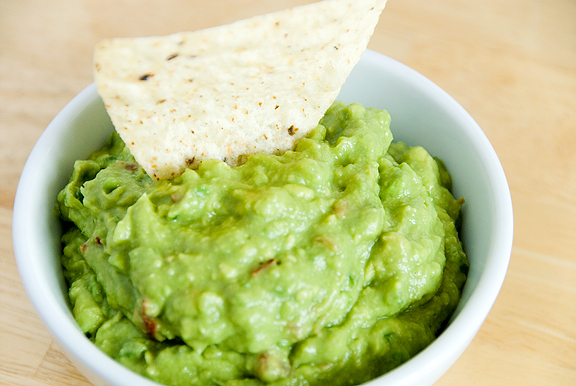 Your guacamole looks delicious and easy! Very inviting to make. I have to also say that your photos are stunningly beautiful! There are places where using lemon instead of lime in you guaq is considered sacrilegious. Amazing! Love this dip-sauce! Thanks so much for this!! looks great, but no cilantro?? mmm… cilantro is my favorite part of guac. Where’s the cilantro? You can’t make guacamole without cilantro! I absolutely LOVE guacamole! Your pictures are beautiful! i hope to plant an avocado tree in our yard soon, and limes, and tomatos. i’ll definitely give your recipe a try when they start bearing fruit! 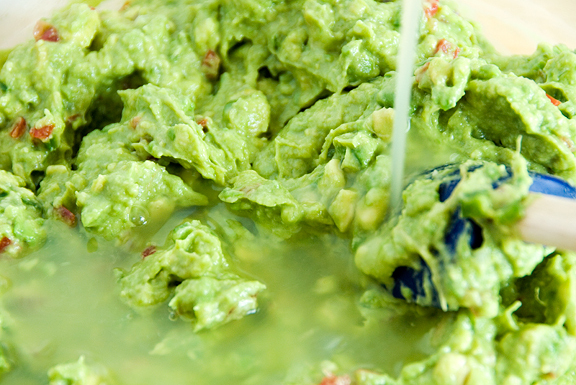 A suggestion – keep the pit (or a few if you make a big batch) and put it in the serving/storage container with the guac. This keeps the guac from going brown and slimey. It works and keeps everything pretty! Susan – I hear ya, sistah. Cindy – hey thanks :) I consider myself dragged. Caroline – yeah, I sure do love chunky guac too. I have avocado tree envy as well. A.Grace – admittedly, I eat it with a spoon when I can get away with it ;) hee hee. I personally think it should be elevated to entree rather than a mere condiment! Coffee and Vanilla – oh yum! Peabody – you got it, girlfriend. Nicisme – even easier to devour, tee hee. Shandy – yeow. I feel your pain – and thanks! Seventh Sister – yeah well, I didn’t have limes and I had lemons. I use the two interchangeably and love them both. Pete – sorry, but I can’t eat cilantro right now because of my immune system issues – have to wait until my chemo is over. DivaDivine – um, let me refer you to Pete above. Gaga – oooh, I am jealous that you can even think to plant them in your yard!! Gesina – thanks for the tip! I’ve used pits before and they work where they keep O2 from contacting the guac, but where the surface isn’t covered, it turns brown. A good flat seal of the plastic wrap directly on the guac works quite well. I just made it. Added a splash of honey and some spicy sauce. Tasttty. Why do you crush the garlic and salt together? Confession time. Sometimes I don’t have tomatoes (or onions, for that matter) in my kitchen. Only avacados and they going over-ripe FAST so I have to deal with them. I add… salsa. >_< Salsa from a jar, not even the home-made stuff. I know, horrible. I should be shot, also, for sometimes adding sour cream or (*cringe*) just a DAB of mayo. Just a dab! Barely any at all, I swear! But the guacamole goes like hot-cakes so I guess it’s acceptable if it is popular…. Once I made I-don’t-know-how-much-but-a-lot of guacamole for a party once and I mashed up the ‘cados, diced toms, minced onion and garlic, lime (not lemon. Lime adds a certain lovely taste to it all), a dollop of sour cream, and some healthy spoonfuls of this amazing chipotle salsa. The color suffers a bit from the salsa, but the chipotle just adds this wonderful smokiness to it. I should probably add actual chipotle instead of salsa, but I don’t have any. Have you tried oven-roasting the jalapeno beforehand? I never work with chilis, but once my mother made this amazing mango-ginger-jalapeno salsa for roast pork and boy, roasting the jalapeno beforehand made it truly nummy. Luney – I’ve never roasted them beforehand, no. Sounds good though!